The new MRU Conservatory Bella Concert Hall is home to the Calgary Philharmonic Orchestra’s Education Concerts. Open to the public since September 2015. The Bella Concert Hall — at the heart of the new Conservatory — is named for Taylor family matriarch Mary Belle Taylor, known simply as Bella to all who knew and loved her. 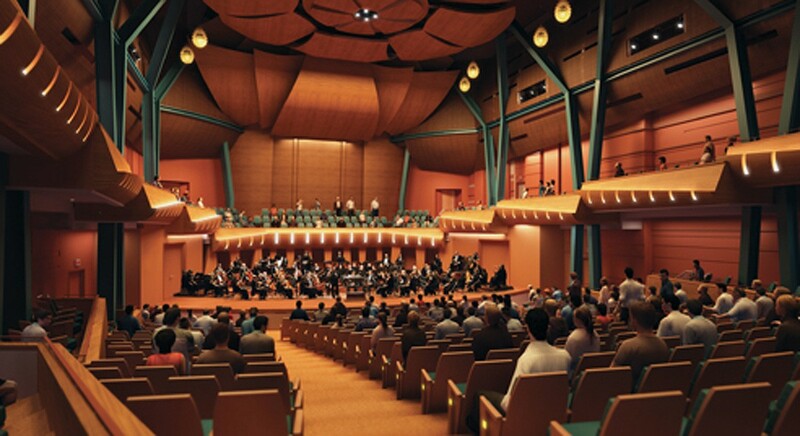 The Bella Concert Hall will provide a venue unique in the city of Calgary: 773 seats, and 14 wheelchair capacity, perfect for performances requiring an intimate setting and superb acoustics. The interior of the hall’s design pays homage to Alberta’s rural heritage with structural elements reminiscent of the weathered barns that dot the province’s prairie landscape. Evening/Saturday parking rates apply after 4 p.m. Monday to Friday and all day Saturday. Parking in the above lots is free on Sundays and statutory holidays. Payment Methods Paystations accept Cash, Visa or Mastercard transactions. East Gate Parkade and Lot 2 use a Pay on Foot system. Parking under 30 mins is complimentary. Paystations for the East Gate Parkade are located on levels 1, 2 and 3. Paystations for Lot 2 are located at the West Gate and Recreation entrances. Lot A & B use a Pay-and-Display system, and charge a flat day-rate (Coins, Visa or Mastercard). Travelling from the east or west, use Glenmore Trail. Travelling from the north or south, use Crowchild Trail. At the second set of traffic lights, the Richard Road and Mount Royal Gate intersection, turn left and drive into campus. Exit left at 37th Street S.W. At the second set of traffic lights on Richardson Way, turn right into campus. Exit right at 50th Avenue/Mount Royal Gate and continue right onto Mount Royal Gate. Continue straight at the first set of lights – the Mount Royal Gate and Richard Road intersection – and drive into campus. Exit right at 50th Avenue/Mount Royal Gate and turn left onto Mount Royal Gate.